I love these lamps! I bought two for my new house, they will go on each side of the tv in the theater room. The house is not finished yet, I will post pics as soon as I can. 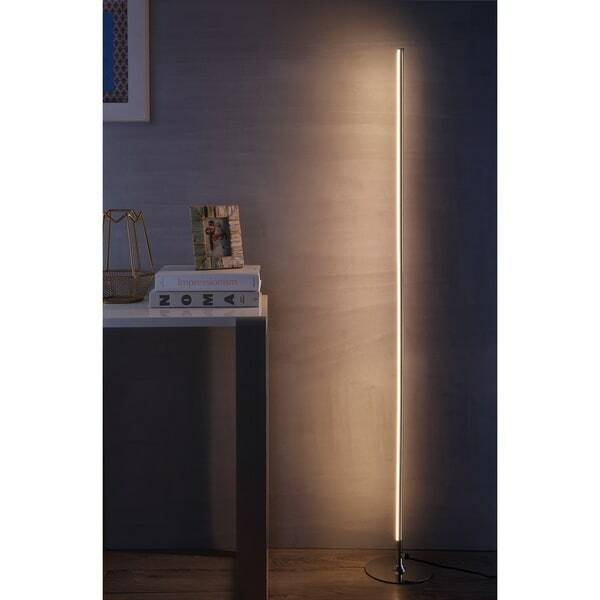 Brighten up your home like never before with this 59.5-inch LED floor lamp. This lamp is constructed with a plated chrome metal base and an on/off switch so you can use with ease. 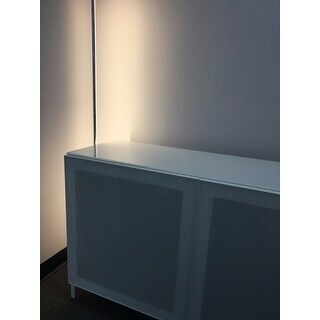 The slim frame features integrated LED lights that offer energy-efficient white light. The idea of this light was good but when I received the item it was bent to all hell. I contacted the sell twice and filled out the RMA correctly and never heard from Overstock nor the seller. I would highly recommend not buying this item. I love this light. It is thin, tall, with a chrome base. Even though I do not like chrome finishes it projects the right amount of light and looks stunning in my den when lit. It looks great! However, if the LED light is in a sight line it’s blinding. 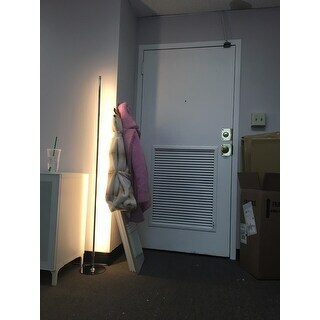 Need to find a good spot to place the lamp and point the light away from direct sight. The chrome finish blends nicely with my stainless steel furnishings and artwork. It's space saving while emitting ambiance lighting which is just what I was hoping for. The lamp looks and feel high quality so as not to detract or diminish the expensive pieces in the room. Great lamp! Very bright and beautiful lamp with quality and sturdy material. Definitely provides the light you need. I was skeptical but it's pretty bright. Can be a little dull looking when the light is off, so I just the chrome facing forward and that helps to keep it classy. The light tends to come with a bow or bend in it which can carefully be manipulated into a somewhat straight line. The light is extremely bright, almost too much so. It can’t be used as an accent light due to the brightness or color temperature of the light. This light is not dimmable by any means so, don’t waste your money on an LED dimmer switch inline or other. Other than that, if it fits your needs, it seems to be well built but the base could be larger to support it from being bumped and knocked over. Beautiful lamp, but arrived with a slight bend as others have described. Came with white gloves for assembly that I didn't find until after I was done. Assembly was simple and straightforward. This has a foot-pedal-type power switch. The light is bright, and it's great for ambient lighting near the corner of a room. Very unique piece! Exactly as described! 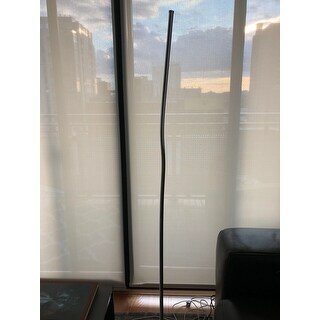 This floor lamp is just what I needed to add some much needed light to a room with no table lamp space. I am in love with this light. Just as pictured. Very bright. The tube is very slim. Only thing that needs to be done to assemble is screw thin tube to the base. There is a foot pedal to turn on so you don’t have to touch the light itself. I would give it FIVE stars, but there's NO DIMMER on this and it's VERY bright! Also, the light that comes from it is also very BLUE... I am going to have to find some theatre light gels to deaden the light and change the color. Very nice accent light for a corner. I was very pleased. The only complain, I wish the stand would look a little more solid or would be made out of different material. After a while the chrome has scratches and doesn't look as good anymore. Also you see every dust particle on it. For the money this is an excellent light. I would have given it 5 stars if you could dim or step down the light. I am still happy with the purchase. When I purchased this lamp, I sort of jumped the gun. So, when I finally opened the box, it looked great. Problem....will not attach to the base! It’s completely useless. I’d happily give a better review, if I could return/exchange the lamp. Really disappointed. Cant wait to see it. Neighbor got it off my porch. I was damaged when I opened the box. It was bent. Love the idea of the light, but it needs a dimmer. It hurt my eyes to look directly at it. I turned it to face the wall and it still provides illumination but it loses the appeal of seeing the actual light itself. Cool concept poor execution. Adds a very unique lighting experience to the living room. Quite a nice lamp, when placed/shined up against the wall it illuminates a room without putting any glare on any one objexct specifically. Will probably buy another for another room. I've gotten many compliments about this beautiful light at my new beauty studio. I use it during makeup appointments to create bright studio lighting and when I'm not with an appointment, I turn the bright bulb side towards the wall. Love the effect - very modern. "Is this light bright white or warm white (yellow)?" This is a pure, bright white light. "I just received this lamp and it is too bright for my taste. Can you add a dimmer?" No, I wish!!! It needs one. "Can this be used with 220-240V?" We would not advise 220V, that voltage is typically for heavy appliances. "Anyone tried to use a smart switch with this light?" you could use a smart switch with it, but it would have to be just an on/off switch not a dimming switch. I wish you could dim it, but you can't. "Is it dimmable and what type of dimmer is needed?" no it isn't and I would say it is the one bad thing about it but for it price its and excellent light. "What is the shipping weight of this item?"